Unsurprisingly, as a Chief of Army, I am not an adherent to the false god of ‘high tech war’, that declares armies redundant, so banal is this analysis. Lieutenant General HR McMaster speaks in his usual compelling manner on this topic in his recent essay, Change and Continuity: the Nature of Future Armed Conflict. The Australian Army’s 2014 Future Land Warfare Report, identified five trends that will likely shape future war: crowded, connected, lethal, collective, and constrained, these trends are also converging. These are not simply big or pervasive changes—they broadly outline our future operating environment and will transform the ways we think, operate, cooperate and contribute as an army. These projects combine to deliver vehicles that are more than replacements for their predecessors—they provide protected weapon systems, which are also a hub for communications, information, sustainment and fire support, enhancing the capacity of a ground force to absorb surprise and achieve tactical success in an era of democratised lethality. 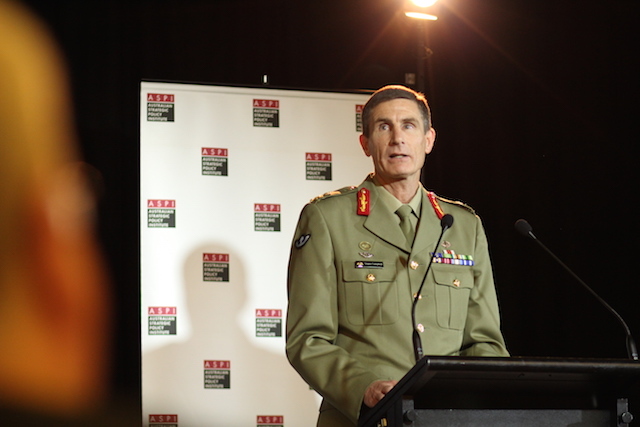 This post is an edited version of the speech Lieutenant General Angus Campbell delivered at the ASPI Army’s Future Force Structure Options Conference on 25 June 2015. Angus Campbell is Chief of the Australian Army. Image © 2015 Australian Strategic Policy Institute.